Delivering advanced web applications is exactly what we do! With experience in designing, developing and supporting web applications, Kapaline is the reputable and reliable “one-stop” vendor to realize your most ambitious and complex projects. Functional and highly usable web applications matching your business needs, requirements and expectations. Full control and transparency of the development process backed with seamless communication. Smart and open application architecture allowing for high solution productivity and scalability. Mature QA procedures throughout the entire software development life cycle. High application maintainability enabling to reduce the total cost of ownership. Deployment, stabilization and ongoing support & maintenance of the delivered application. Our commitment to long-term partnership is reflected in full-cycle services covering every aspect of software production and implementation. We offer complete transparency of activities and deliverables, mature project management, and seamless communication. What do we call a successful web application? There are four major parameters to be considered. First, the application must accurately, stably and productively fulfill its business function. Second, the app must be easy and cost-effective to maintain. 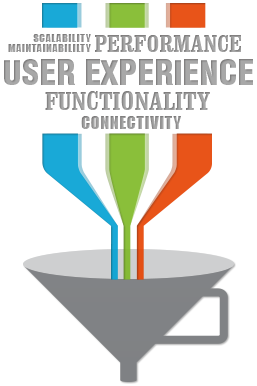 Third, it must deliver positive user experience. And, most importantly, it should have a reasonable price — so that the benefits you receive are worth the expenses incurred, or, in other words, you should get an acceptable ROI. Kapaline Digital Media and Consultancy Services LLP.